Jackson Pollock is considered the most inspiring and influential American artist of the twentieth Century. It was the winter of 1947 when, sitting in an unheated former barn, Pollock took a series of decisions which eventually would lead him to break with traditional painting formulas once and for all, both changing preexisting schemes about the making of art and providing a new artist model. As proof of this turning point he didn’t leave a letter nor a specific image, but a series of works executed with the pouring and dripping technique, letting the paint drip directly on the canvas creating intricate line webs rithmically dotted with colour splashes. His coreographic and ocasionally violent gestures would earn him the epithet of Jack the Dripper, with a clear reference to the far more vicious Jack the Ripper, as well as the critics’ rejection. Luckily it didn’t take many years before the genius from Wyoming was rehabilitated and became established as a prominent figure in the international artistic landscape. Amongst the critics who understood and defended Pollock’s position was William Rubin, collector, critic, curator at the Museum of Modern Art of New York City for twenty years and director of its Painting and Sculpture Department. 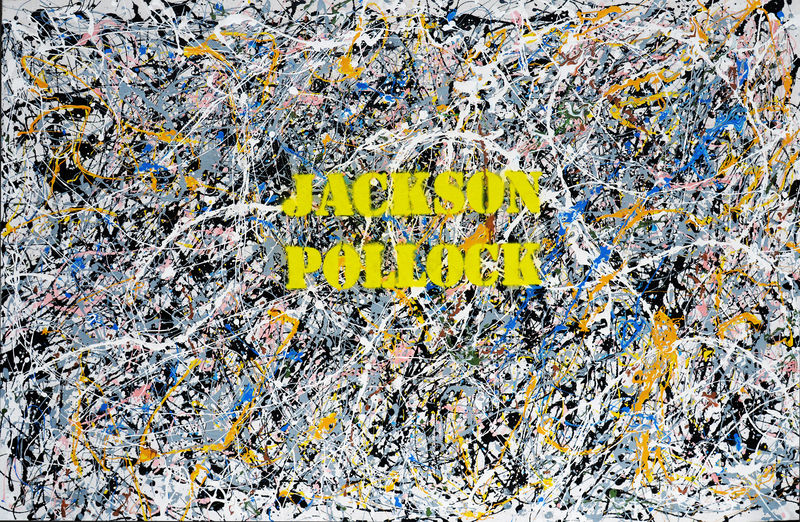 In his essays he would affirm that the capital of modernity had permanently moved to the USA thanks to Pollock’s work, which in 1950’s New York had the same impact Impressionism had had in the late nineteenth-century Paris. Copied, mimicked, criticized, trivialized and praised – also because of his behavioral issues and alcoholism – Pollock was a brilliant, anguished man, always straining between kindness and violence. An artist whose works range from the most delicate lyricism to the most impetuous force. «I’ve had a period of drawing on canvas in black – with some of my early images coming thru – think the non-objectivists will find them disturbing – and the kids who think it simple to splash a ‘Pollock’ out» wrote Pollock to Ossorio – the friend who gave him critical and financial support – on June 7th 1951, as if he had foreseen the multitude of imitators who would make the pouring and dripping their own stylistic hallmark. A prediction which came true while Pollock was still alive and hasn’t been contradicted yet. Frank Stella, Roy Lichtenstein, Jaime Dine, Claes Oldenburg, Lynda Benglis, Eva Hesse were amongst the artists able to look at his teachings again with a more detached perspective. Some shared his way of obtaining non-imaginary shapes from the raw nature of materials, even non-artistic ones, others took inspiration from the use of real forces such as gravity. In accordance with the broadest intellectual currents of the time, the focus on Pollock’s works moved from the psychological interpretation of the fifties to the structural approach of the nineteen-sixties, and later to the emphasis on process and materials that characterized the following decade. Pollock was equally influential on the work of those artists who, in the eighties, brought the attention back to painting, be it Anselm Kiefer’s large canvas, Sigmar Polke’s alchemic fluidity or Brice Marden’s calligraphic poetry. The retrospective held at the Parisian Centre Pompidou in 1982 contributed to the historicisation of the artist figure, who ceased to simply be the object of debates. The first catalogues raisonnés began to lay the foundation for organised information. Starting in the nineteen-nineties, a great number of essays and critical works became available. This led to the raising of the most interesting questions, one of which concerning the role played by Pollock in western culture. That’s how the formidable impact of his art became clear. His works truly had the power to incarnate the spirit of their time, from existentialism to the atomic bomb. For better or for worse, his art – in its grandeur and misery – ended representing the essence of what America was. As a stereotype of genius and recklessness, none of his colleagues from the fifties will better incarnate the archetype of the brand new, rebel, typically American youth which became a synonym of freedom. The works making up the collection entitled From Jackson to Jackson feature the use of the dripping technique juxtaposed to written quotes from this great American artist. The idea of working on Pollock’s production came to my mind a few years ago, after seeing his first paintings realized with the revolutionary dripping technique displayed in Venice, at the Peggy Guggenheim Collection, and a couple of months later in New York. In those years I had begun my research on a form of painting able to convey the energy and force involved in the creative act. I was working on the concept of space. A space without a centre. Or even better, where anything could become the centre, allowing the spectator to enter the painting from any point. I would resort to shapes and colours that could go beyond the boundaries set by the frame, and lay my canvas on the floor in order to be able to circle them. Pollock was a true revelation. I started gathering information and became aware of the strength of his style. But what struck me above all was the man himself. Loosing any sense of responsibility towards himself and others, he suffered from neurosis, depression, recklessness, overexcitement, alcoholism and self-destructive tendencies. His patron Peggy Guggenheim once described him as «a trapped animal who should have never left Wyoming». Pollock was at times a national hero, at times just a maudit. Could he have been any different? Well, no. And he paid a very high price for being himself. Perhaps, as many others, I was fascinated by his sudden but at the same time unsurprising death. In this concern I must unexpectedly join the critics. It was a predictable ending – both his greatness and his power were those qualities that led him to a death which may have been avoided had he not lived with such intensity, or had he been willing to reach compromise, had he stored some energy, which is to say had he not been who he was… Jackson Pollock. For all these reasons, there came a certain point when it felt natural to pay him a tribute. My aim was to create a collection where my personality was put in the background, letting his emerge. In the paintings I didn’t simply use the pouring and dripping technique, but downright mimicked Pollock’s works. At times I employed the same colours, which is the reason why his name and thoughts are clearly impressed on my canvases. 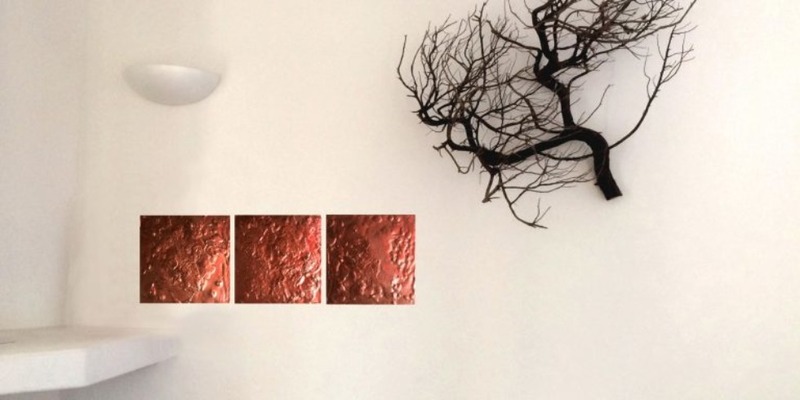 – paintings featuring the same colour scheme as Pollock’s, as well as his signature or quotes. – paintings autonomously conceived in terms of colours and concepts, after my research on the artist. Jackson Pollock è considerato l’artista americano più stimolante e influente del ventesimo secolo. 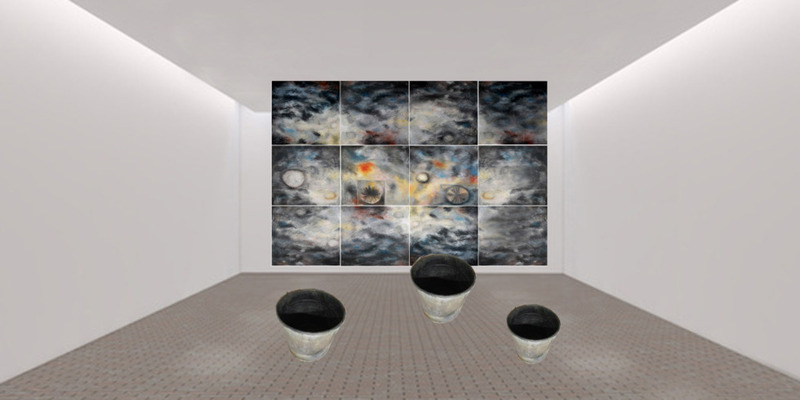 In una stanza prima adibita a granaio e non riscaldata, all’inizio dell’autunno 1947, Pollock prese una serie di decisioni che gli avrebbero permesso di rompere per sempre con le formule tradizionali della pittura modificando gli schemi esistenti di come l’arte potesse essere realizzata e offrendo un nuovo modello di come si possa essere artisti. Non ci ha lasciato una lettera o un’immagine ben precisa che possa testimoniare la “svolta” ma una serie di opere eseguite con la tecnica del “dripping” e del “pouring” lasciando, cioè, sgocciolare la vernice direttamente sulla tela e creando complesse ragnatele di linee ritmicamente punteggiate da macchie di colore. Le colature del colore eseguite con gesti coreografici, a tratti violenti gli sarebbero valsi l’appellativo di Jack the Dripper, con chiaro riferimento al ben più violento Jack the Ripper (lo squartatore) e un primo pesante rifiuto della critica. Fortunatamente non ci vollero molti anni per riabilitare il genio venuto dal Wyoming e assegnargli un posto di rilievo nel panorama artistico internazionale. Uno fra i tanti critici a capire e difendere la sua posizione fu William Rubin, collezionista, critico, curatore per vent’anni al Museum di New e direttore del Dipartimento di Pittura e Scultura. Affermò nei suoi saggi che “la capitale della modernità si trasferì definitivamente in America grazie al lavoro di Pollock che corrispondeva per la New York degli anni 50 agli effetti che l’Impressionismo aveva creato nella Parigi di fine Ottocento”. Copiato, imitato, criticato, banalizzato, osannato, anche per i suoi problemi comportamentali e legati all’alcolismo, Pollock rimase un uomo brillante e tormentato, sempre in tensione tra la dolcezza e la violenza, un’artista capace di creare opere che vanno dal delicato lirismo alla forza più impetuosa. “Gli ingenui penseranno che sia semplice fare un Pollock a gran colpi e schizzi di colore” aveva affermato il 7 giugno 1951 a Ossorio, l’amico che lo supportò criticamente e finanziariamente, come se avesse potuto già prevedere la schiera di “imitatori” che del “dripping” e del “pouring” avrebbero fatto una delle cifre stilistiche della propria arte. Operazione iniziata mentre Pollock era ancora in vita e che continua tutt’oggi. Frank Stella, Roy Lichtenstein, Jaime Dine, Claes Oldenburg, Lynda Benglis, Eva Hesse furono solo alcuni degli artisti in grado di riesaminare con un occhio più freddo la sua lezione. Altri condivisero il suo modo di derivare forme non-immaginarie dalla natura grezza dei materiali anche non artistici, altri presero spunto dall’impiego di forze reali come la gravità. In armonia con le più ampie correnti intellettuali del tempo, l’attenzione per le opere di Pollock si spostò da un’interpretazione psicologica negli anni ’50 a una lettura strutturale intorno al 1960, all’enfasi sul materiale e sul processo intorno agli anni ’70. Pollock fu ugualmente implicato nell’opera degli artisti che riportarono l’attenzione alla pittura negli anni ’80, dalle opere a grandi dimensioni di Anselm Kiefer, alla fluidità alchemica di Sigmar Polke e alla poesia calligrafica di Brice Marden. La retrospettiva al Centre Pompidou di Parigi nel 1982 contribuì a rendere “storicizzata” la figura dell’artista e non solo soggetto di dibattiti. I primi cataloghi ragionati incominciarono a stabilire una prima base di informazioni organizzate. A partire dagli anni ’90 grandi quantità di saggi e critica furono disponibili. Fu quindi possibile arrivare agli interrogativi più interessanti incluso quello più importante: quale fosse il significato del lavoro di Pollock per la nostra cultura occidentale. E ci si rese conto di quale formidabile impatto la sua arte abbia avuto sulla nostra cultura. Le sue opere ebbero veramente il potere di incarnare la loro epoca in toto: dall’esistenzialismo alla bomba atomica. La sua arte, nel bene e nel male, nella sua grandezza e nella sua miseria, finì per rappresentare l’essenza di ciò che era l’America. Stereotipo di «genio e sregolatezza», nessuno dei suoi colleghi degli anni Cinquanta incarnerà meglio di lui l’archetipo di una gioventù nuova e ribelle, americana per eccellenza e sinonimo di libertà. “sgocciolamento” su cui sono state inserite frasi, pensieri, riflessioni del grande artista americano. L’idea di lavorare sulle opere di Pollock è nata alcuni anni fa, dopo aver visto i primi dipinti realizzati con la tecnica rivoluzionaria del dripping a Venezia, alla Peggy Guggenheim Collection e dopo pochi mesi a New York. In quegli anni avevo iniziato le mie ricerche su una pittura che fosse espressione di una gestualità che rendesse visibile l’energia o la forza impiegata nell’atto creativo. Lavoravo sul concetto di spazio nel quadro; uno spazio dove non ci fosse più un centro. O meglio dove tutto potesse essere centro in modo da permettere l’ingresso nell’opera da un qualsiasi punto. Lavoravo con colori e forme che potessero superare i confini della cornice, con tele stese per terra, in modo da poter girare loro intorno. Pollock fu una vera rivelazione. Mi documentai e mi resi conto della forza del suo linguaggio. Ma sopra a tutto mi colpì l’uomo. Con la perdita completa di ogni senso di responsabilità verso se stesso e gli altri, soffrì di nevrosi, depressione, irresponsabilità, sovraeccitazione, alcolismo, spinte di autodistruzione. “Animale in trappola che non avrebbe mai dovuto lasciare il Wyoming dove era nato” lo definì la sua mecenate Peggy Guggenheim. Uomo a tratti “eroe nazionale”, a tratti solo “maledetto”. Avrebbe potuto essere diverso da com’era? No. E il prezzo che pagò per questo, come uomo, fu altissimo. Per questi motivi ad un certo punto delle ricerche mi è sembrata un’operazione naturale dedicargli un tributo. Ho voluto creare una collezione che mettesse in secondo piano la mia personalità per far emergere soprattutto la sua. Con le opere “Da Jack a Jack” non ho solo utilizzato la tecnica del “ dripping “ e del “ pouring”, ho proprio “imitato “ le pitture di Pollock. In alcuni casi utilizzando palesemente gli stessi colori: per questo le mie opere sono palesemente marcate col suo nome ed i suoi pensieri . Quelle che ho elaborato autonomamente nei colori e nei concetti, dopo aver studiato i documenti riguardanti l’artista. Il Progetto è tuttora aperto.